Delicate, by-the-fire music. Your heart just wants to wrap itself around these sounds, keep them close, promise to take care of them because they are so precious. Put Ms Scott—Trinidad-born, Julliard-trained prodigy of the piano—in Rudy Van Gelder’s recording studio on a cold winter night in 1955 with Charles Mingus and his bass, Max Roach and his drums, and the freedom afforded her by the record label founded and owned by these two eminent members of her rhythm section, and what you get is magnificence. The trio converses so effortlessly with one another. 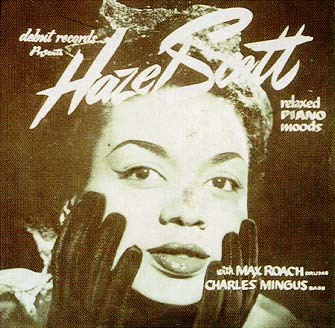 Hazel Scott—also a classical pianist who has soloed with the Philadelphia Orchestra, the New York Philharmonic, and others—leads the exchange with musical intimations so breathtaking and inviting that Mingus and Roach can’t help but dive right in and support what she has to say with their own musical expressions of strength, humor, and subtlety. Years later, Mingus would play quite a bit with a fellow named Pullen. I’m no musicologist, but as a big fan of Don Pullen i have to think he must have spent some important wee hours in his formative years with this Hazel Scott record. So thank you to Hazel Scott, a shout out of thanks to one with the capability and courage to lead leaders. Have a listen. A good deep one. After recently moving twice, sorting again through what goes where, what is needed and what isn’t, to me Jane Siberry’s recent life change isn’t as crazy as it might seem. Read about it here. Wish i’d been there when she tossed her master tapes though. Play with a drum machine. They’re small. Talk to all your friends on the phone. Soon you won’t have time to. Attempt yet again to get the electrician on the phone. And again and again. Work harder at entertaining your pets. Verify with your physician or pharmacist that these little things are in fact the ones you’re supposed to be taking. Browse the local hardware store. See Tom Jones in concert. Revisit the piano works of Charles Mingus. Bake a pie for your neighbor. Locate a good consignment shop nearby. Continue the search for a good, affordable Prosecco. Discuss with professionals the advantages and disadvantages of two layers of Sheetrock versus a layer each of Sheetrock and Homasote. Peruse Shamit Kachru’s popular and highly cited paper, “De Sitter Vacua In String Theory” [Phys. Rev. D 68: art. no. 046005, 15 August 2003]. Make yourself a cup of tea. Work in somebody else’s studio.